Who Was Pandora and Why Does She Get Blamed for Everything? Poor Pandora couldn't resist a little peek into the box she was entrusted with. And then look what happened. It's amazing how long men have been blaming women for their own weakness—and of course all the ills of the world. Take Pandora for example. The first mortal woman, created by the gods, she only did what she was made to do. Yet her story (first recorded by the Greek writer Hesiod in the 8th—7th centuries B.C.) became the excuse for the ruin of mankind and, by extension, the model for the Judeo-Christian tradition of Eve opening the way for Original Sin and the expulsion from the Garden of Eden. Versions of the story of Pandora are among the oldest Greek myths of the Titans, the parents of the gods, and the gods themselves. Prometheus and his brother, Epimetheus were Titans. Their job was to populate the earth with men and animals and, in some stories, they are credited with creating man from clay. But they quickly came into conflict with Zeus, the most powerful of the gods. In some versions, Zeus was angered because Prometheus showed men how to trick the gods into accepting inferior burnt offerings—"If you wrap those beef bones in nice shiny fat, they'll burn well enough and you can keep the best cuts of meat for yourself". An angry—and probably hungry—Zeus punished humanity by taking away fire. Then, in the more familiar part of the myth, Prometheus gave fire back to mankind, thus enabling all human progress and technology. Zeus punished Prometheus by chaining him to a rock and sending eagles to eat his liver (forever). But clearly, that wasn't enough for the Zeus. He ordered the creation of Pandora as a further punishment—not just of Prometheus—but all the rest of us as well. Zeus gave the task of creating Pandora, the first mortal woman, to Hephaestus, his son and the husband of Aphrodite. Hephaestus, usually depicted as the blacksmith of the gods, was also a sculptor. He created a beautiful young girl, capable of evoking strong desire in all who saw her. Several other gods had a hand in creating Pandora. Athena taught her womanly skills—needlework and weaving. Aphrodite clothed and adorned her. Hermes, who delivered her to earth, named her Pandora—meaning all giving or all gifts—and gave her the power of shame and deceit (later, kinder versions of the story changed that to curiosity). She was presented as a gift to Epimetheus—Prometheus's brother, remember him? He doesn't get many column inches in most of Greek mythology but he plays a pivotal role in this story. Prometheus warned him not to accept any gifts from Zeus, but, my goodness, she was awfully cute so Epimetheus ignored his brother's good advice and took her for his wife. Interestingly, Epimetheus name means hindsight and he is often considered the god of afterthought and excuses. Pandora was given a box full of trouble. 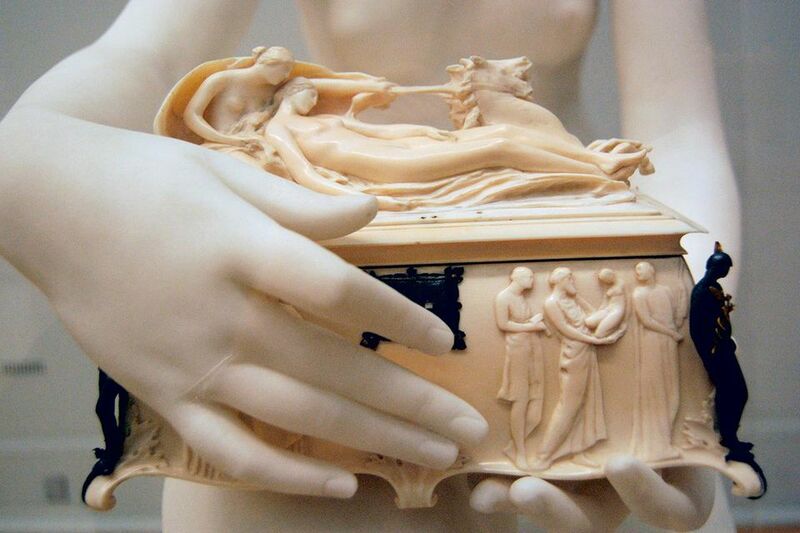 Actually, it was a jar or amphora; the idea of a box comes from later interpretations in Renaissance art. In it, the gods put all the troubles and ills of the world, disease, death, pain in childbirth and worse. Pandora was told not to look inside but we all know what happened next. She couldn't resist a peek and, by the time she realized what she had done and snapped the lid shut, everything in the jar had escaped except hope. By the time the stories of Greek mythology were written down, they had already been part of the culture's oral tradition for centuries, perhaps millennia. As a result, many different versions of the story exist, including Pandora's name, which is sometimes given as Anesidora, the sender of gifts. The fact that there are more versions of this myth than other traditional stories suggests that it is one of the oldest. In one story, Zeus actually sends her with great gifts for mankind rather than evils. In most versions she is considered the first mortal woman, brought into a world inhabited only by gods, goddesses, and mortal men—this is likely the version that has come down to us through the biblical story of Eve. Because she was not a goddess nor a hero, and because she was associated with "trouble and strife", there are no temples dedicated to Pandora nor heroic bronzes to look at. She is associated with Mount Olympus because that was considered the home of the gods and that is where she was created. Most depictions of Pandora—with a box—are in Renaissance paintings rather than in Classical Greek works of art. Her creation was said to have been depicted on the base of the giant, gold and ivory statue of Athena Parthenos, created by Phidias for the Parthenon in 447 B.C. That statue disappeared around the fifth century A.D. but it was described in detail by Greek writers and its image persisted on coins, miniature sculptures and jewels. The best way to find an image that might be identified as Pandora is to look at classical Greek vases in the National Archaeological Museum in Athens. She is often depicted as a woman rising out of the ground—since Hephaestus created her from the earth—and she sometimes carries a jar or small amphora.